As we head into the holiday season, there are some people in our lives we struggle to buy for. This year we have come up with great Gift Ideas For Travelers that are sure to make your glove trotting friends thrilled to be your friend! Those who love to travel, often scrimp on the luxury items for themselves so they can afford their vacations. This year invest in one of these great gift items to help them have a wonderful trip the next time they hit the road. Swiss Gear Zuirch 20″ Pilot Rolling Case: This suitcase is the perfect one for anyone who likes to travel and use carry on instead of checking their bags. This 20″ pilot case has tons of room, hidden laptop storage with extra padding, zipper compartments on the front and inside for extra storage. Great compartments and flaps for putting small items to keep safe. Swiss Gear Zurich 22″ Rolling Duffle Bag; If you prefer a duffle bag style, this slightly larger case by Swiss Gear is great. Easy to roll, or collapse the handle and carry as you would any other duffle bag. Fits easily into overhead bins and great sturdy construction will last for years. Swiss Gear ScanSmart Backpack: If you are a light traveler, or want to check bags but keep your electronics handy during flight, this backpack is perfect. Large enough to safely carry your 17″ laptop in the padded compartments, but small enough to go in overhead bins, or even under seats for in flight storage. With multiple padded areas you can tote your laptop, eReader, tablet or phones and gaming systems without fear of cracked screens or breaking! Mosey Life Ladies Laptop Bag: This cushioned, colorful and fashionable laptop bag is not only functional but fashion forward. The ladies on your list will love it’s versatility and the fact that it can double as a great tote while out and about as well! Kattee Mens Leather Briefcase Laptop Bag: If you want classic and quality this is the bag for you. Messenger style tote that is made just for your laptop or to be used as a classy briefcase. Every business man and world traveler should have one of these on hand. Kindle Fire HDX: Everyone needs a great tablet and eReader. This Kindle Fire HDX brings the best yet! Full color, HD screens, eReader and tablet all in one great little 8″ package, this is sure to make anyone on your list happy this year. Perfect for the entertainment or work minded person. Beats Studio Over Ear Sound Canceling Headphones: Anyone who has been on a lengthy flight knows that it is nearly impossible to relax and nap with all the noise around you. These noise canceling headphones are perfect to keep the sound in, and not out disturbing others. They also make a great tool to give you peaceful noise that drowns out those around you. Body Innovations Massaging Travel Pillow: Need a nap in the car or on the plane? Grab this great pillow! Not only will this provide the neck support needed for comfort, it will also help ease tension with the great massage feature. Jockery Battery Operated Phone Charger: There aren’t always great options for charging stations along your journey. When you are out and about, this great Jockery charger is perfect. Charge it in advance and pack for use to recharge your cell phone along the way. When you are looking for great gift ideas for travelers, look no further than this great list. Not only do you have items to meet their needs, you also have some great things that will be fun treats for them. Quality products will last longer, and give them just what they need! Are you always on the go? 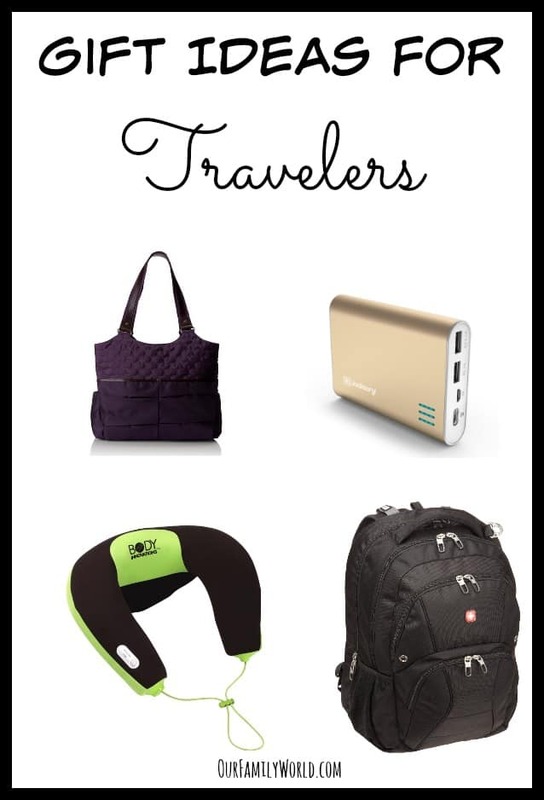 Which of these gift ideas for travelers would you love to receive? I would love the Swiss Gear Zurich 22″ Rolling Duffle Bag! Sure could use the phone charger! Great list! That ladies’ laptop bag is absolutely stunning! I love the color. I need a good phone charger. Absolutely essential! I am always forgetting it! A good phone charger is a must especially when you are not able to sit down and charge up for several hours. The phone camera eats up the battery very fast. I need that Jockery phone charger! And I’d love a massaging neck pillow! Great list of items for anyone who travels. Great list for commuters as well. A lot of nice gift for travellers. I could really use the Body Innovations Massaging Neck Pillow with Heat. That would make it more comfortable when travelling by any mode of transportation.